The time has come to teach your Labrador how to let you know when he wants to go out. This is very important command for you and your Lab. It simply makes your life easier. Ideally, you’ve been showing him this all along the way. A small tip for the owners: Go on and scratch the door as you are leaving the house. This is the way you can teach your Lab a command to go out. Once he is 3 months old, you might notice him scratching the door on occasion. If you do see that, give him lots of praise for it. That is one smart and quick learner! 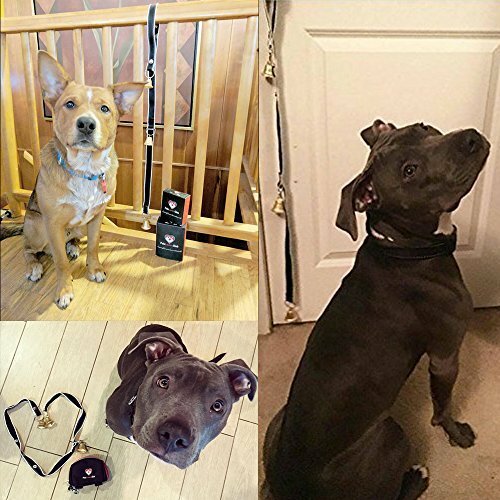 You’ve probably heard of the owners who teach their puppies to ring a bell with their nose when they feel the urge to go out. I’ve read about people trying this with different breeds. Some of them just scratch the door next to the bell. So if your Labrador doesn’t get the “scratch” command, it doesn’t mind, he might get the “bell”. Every dog is different and you must know that! My advice is to go and get sleigh bell on Amazon and attach them to a piece of cord hanging near the door that leads the way out. It has good height and is adjustable. You can rest easy knowing that your puppy or adult dog won’t get nails or paws stuck in between jingle bells. Every time you take your dog out be sure to ring the bell. Once you feel he is ready to learn how to tell you he wants out, try following the instructions below. Put some of his favorite treats in your pocket. Take the bell off and rub it with the treats. Make sure your Lab feels the smell of the treat while you get it closer to his nose (that way he will probably move closer touching the bell with his nose). Once he touch it, give him a treat and loudly say “YES”. Repeat the steps for about 10 times. Repeat the process twice a day for three or four days. You should teach him the “OUT” command which is used once you step trough the door to go out. How? When you make sure your Labrador understands that he has to hit the bell with his nose, just move the bell little further from him. After he moves and pokes it replace the “YES” word with “OUT”. Reward him each time he does that. Place the sleigh bell beside instead in front of your puppy. Repeat the command “OUT” once he pokes it. Reward him. Keep moving slowly to your doors. Repeat the exercise twice a day for three or four days. Do not forget to place the bell back to the spot by the door. Keep ringing the bell when you take your dog out only during the training period. Once he understands the ringing bell principle, it is time for him to do it at the right moment and for the valid reason. Always keep the treats in your pocket while training your dog. When it’s time to go out, bring your puppy near the bell and command him “OUT”. If he touches the bell, you should reward him and walk him out to pee spot. Do not try to give him a free ride by carrying him. He has to hold it until he leaves the house and gets to the spot. Remember – you are the boss, and you are managing when he goes out. This is not as easy as it sounds for sure. Everyone who tried this, or a similar method will tell you the same. 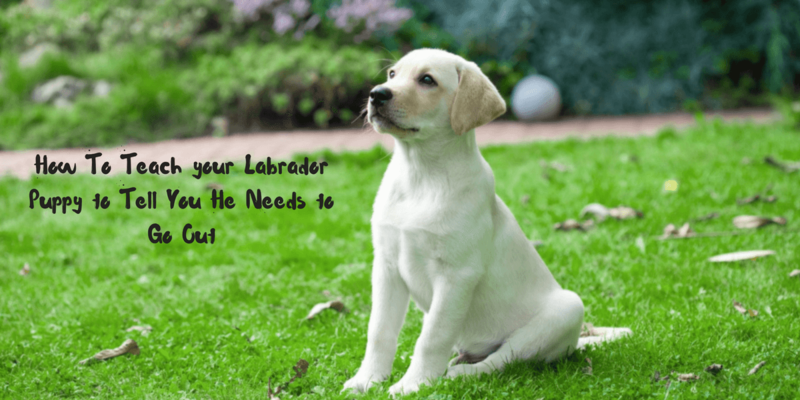 It might take up to three months before your Lab fully understands what he has to do in order to go out. Don’t stop saying “OUT” each time your puppy poke a bell in front of the door before you leave your house. Don’t be surprised if you see your dog paw at the bell instead hitting it with his nose. That is completely fine, as long as he is making use of that bell. IMPORTANT – Do NOT place the bell on the door handle if you use those door for anything else then going out with your dog. Otherwise the bell is going to ring every time and might ruin your training, or even worse, confuse your puppy. 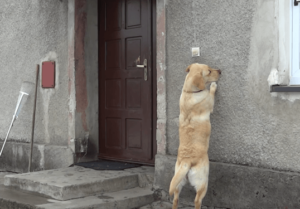 Some dog trainers are saying you don’t have to use these methods when he has to go out. If you create a schedule then your puppy will learn to hold it until it is time to go. If you do decide to go with the schedule method, then you have to follow it for the rest of your dog’s life. My recommendation is to train your dog to tell you when he needs to go out. That is how I do it and it works.